Turtle rock is one of the best night dives in the Similan islands. Night diving gives you an opportunity to see different nocturnal species and different behaviour from other marine life. Turtle rock is a shallow protected bay with generally easy conditions leaving you plenty of time to find the weird and wonderful creatures hiding in various nooks and crannies. Turtle rock is at the far North West of Similan island eight, just on the outside of Donald Duck Bay. If your Similan Liveaboard is moored up in the bay, look out West to see the iconic turtle shaped rock that the dive site is named after. A shallow bay with healthy and lively coral heads down at around 18m. The boulders on the Western tip drop to 30m where there are large sea fans and stingrays. As this is usually the last dive of the day, it is better to stay inside the shallower reef area. Turtle rock is a good night dive on a Similan Liveaboard. The boulders along the shallow part of the bay are a good place to find frogfish and sometimes turtles sleep in the caverns. The coral heads a bit deeper come alive at night and you can often see nocturnal animals like giant Moray eels, octopus, squid and lionfish. These creatures are much more active in the dark and it is much more likely to see them hunting. If you have never done a night dive before then it is a good idea to do it as part of your Advanced Open Water course. Diving etiquette, new hand signals, new equipment and different diving techniques all need to be studied beforehand. Night diving is a completely new experience that may not be for everyone, but should be tried at least once. Read the featured night diving guide below for a few more tips. Swimming slowly and taking your time is the best way to find the rarer creatures. If you are diving with an experienced buddy then you can wait for everyone else to jump in before you. Wait until it is completely dark. This gives a chance for all the nocturnal animals to wake up and start their nightly hunt. This is much more atmospheric and will hopefully give you a better chance of seeing some action. The most unique thing you can see on a night dive is bioluminescent phytoplankton. This sparkly green bacteria can light up a night dive like a starry sky. Wait until the end of the dive when it is darkest and swim away from any other lights. Turn your lights off and give it a moment to let your eyes adjust. Wave your hands in front of your face to start a chemical reaction called chemiluminescence and watch the seemingly lifeless water light up in front of your eyes. Boulders run along the edge of the bay and gradually get deeper as they approach the Western tip. The bay itself is shallow with a gradual slope. There are also many caves, caverns and swim throughs in the shallows. Conditions are generally very calm at Turtle Rock, as you have the protection of being inside a sheltered bay. If there are any waves, be careful of the surge they can create next to the rocks. Currents are usually very mild. Anyone new to night diving can learn some new techniques. Position yourself underneath your subject and point the camera up. The flash will light up your subject, but with nothing behind it, you can get a pitch black background. Turtle rock does not have to be a night dive and there is lots more to see in the day. If this is the last dive of the day on your Similan Liveaboard trip, then you may be able to jump in a bit earlier whilst there is still some light. This will give you the opportunity to explore the caverns and swim throughs. Very close to the West tip, at a depth of between 4m-10m, is a maze of openings. There is always a clear exit but you can spend most of the dive finding new secret caverns. Do not explore this area on a night dive as the lack of light can make it dangerous. Liveaboard diving is the best way to experience the Similan Islands. Trips range from a single night to a full week on board. The optimum time to see all of the best sites is on a 4 night Similan Liveaboard including the amazing Richelieu Rock. Above are a few of our favourite Similan Liveaboards. But, we understand that sometimes there is just too much choice. So, if you are not sure what it is you are looking for, please contact us for more advice. Start your dive at the buoy line in the middle of the bay. Directly West from the bottom of the line is where you can find a few big coral colonies with lots of life around them. It is good to spend at least half your dive in this area as there is usually more life here than on the rest of the site. If you take the time to explore, you will find a lot more. The shallowest part of the coral structure is at around 16m. Slowly swim out along the coral to its deepest point at 20m. Here you can find several spearing mantis shrimp, in their holes in the sand, just underneath the coral. If you swim slowly, and look everywhere, you can find small and rare creatures including the oscillated dwarf lionfish. Follow the coral back up to around 16m again. This area is usually quite lively when it is dark and you can look for Moray eels, lionfish and octopus all out hunting. If you want to see more action then just be careful where you point your torch. If you point it directly in the eyes of fish then it is blinding. Not only is this damaging to their eyes, it will also disrupt their normal behaviour. Once you have finished looking around the coral garden then you can shallow up to the boulders in the bay. The edge of the boulders are between 12m-20m. There are various other species that you can find inside the boulder’s cracks, including lobsters, reef crabs and sometimes frogfish. It is also common to see Morays and octopus in the shallows as well. As with most night dives, the key is not to swim too far from the boat. If you swim towards Turtle rock for the first half of the dive, and back along the reef for the second half, then you should be able to see the floodlights at the back of your boat. This makes it easy to navigate your way back to the boat at the end of the dive. Do your safety stop near the back of the boat. You can either use a surface marker buoy or you can point your torch directly towards the surface to make you clearly visible below. Head back onto the boat for a hot shower, dinner and a delicious beverage. Spending the evening on a Similan Liveaboard, in the beautiful Donald duck bay, is everything you could expect from a Thailand diving holiday. The key to a Night dive is to make sure you never swim too far away from the boat. Swim towards the edge of the bay but do not go too far around the corner. You will always want to be able to return to the surface and signal the boat if necessary. From the buoy line stay deeper at the start of the dive. Stay at around 16m and head out West into the sand. After 100m you will reach the large coral heads that form the best part of the dive site. Once you are finished here, start to shallow up again and head back to the boulders. Follow the boulders back East insdie the bay so you will finish the dive at Turtle Rock close to the mooring line where you started. Take a look at one of the other amazing Similan Dive Sites below, or go back to the Interactive Map. Any diver should try night diving at least once in their life. If being underwater already makes you feel like you are entering another world, you should try it at night. Strange nocturnal creatures come out to play and bioluminescent phytoplankton literally make the sea light up like a starry sky. With nothing but a torch and the faint glow of the moonlight, you will find yourself focusing much more on the small areas. You will find interesting life that you would have passed by in the day. It can be a truly magical experience. 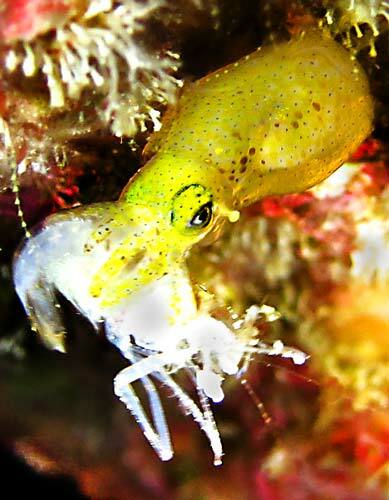 The Similan islands are a great place to try night diving as the conditions are usually so good. The water is so clear that even the moon can illuminate the dive site. If you turn off your torch you will still be able to see the silhouettes of the reef and marine life. If you would like to try night diving then you will need to join a Similan liveaboard. There are no night diving options available from the mainland. Even if you see many of the same things on a night dive, the whole experience is just more dramatic! The Turtle shaped rock at Sunset. Descending into the dark depths can seem daunting at first, but the rewards are often worth it. You will quickly realise that there is nothing to worry about. Here are a few key tips to help get you started with night diving. A night dive should always be done either at a dive site that you know well, or under the guidance of an experienced dive professional. To help you feel comfortable it is best to start at twilight so you still have some light at the start of the dive. Check your torch beforehand and take a backup light if possible. Dive slowly and never go too far away from the boat. This way you have the security of knowing you are able to surface at any point during the dive. Divers new to night diving tend to have an over active imagination. Whilst it is good to be cautious, most of the time any worries are unfounded. It may take some getting used to but night diving is no more difficult or dangerous than day diving. Practice all of your hand signals with your guide before the dive and relax. Once you get into the right mood, night diving is a fantastic experience. One final great thing about night dives is that they are often a much more personal diving experience. Most of the creatures you see will be small and much more scared of you than you are of it. This means you might only get brief glimpses of the various marine animals before they hide from the bright lights. You are more than likely to discover animals that nobody else in your group finds. This makes it much more rewarding when you do find something. If you have never done a night dive before then it is best to do an adventure night dive as part of your Advanced Open Water course. You will need to learn all the hand signals and different procedures involved. If you want to do it in the Similan islands, the only real option is a Similan liveaboard or overnight trip. There are no night diving options available from mainland in Khao Lak. Contact us if you would like anymore information about Similan islands night diving. With marine life hiding all over the dive site, like this Zebra Moray eel, there is always something new to find. There is no better way to see the Similan Islands than by diving on a Similan Liveaboard. They offer the best overall value and range from just a single night to a full week on board. Enjoy supreme comfort, delicious food, and the best diving in Thailand.